Today for the construction of individual houses for one family, not exceeding three floors, is not required to order the design from a professional architect and designer with a special permit. But still, the project needed to have an idea of how the building, which is going to build, post it on the site optimally and to calculate the amount of materials needed. Such a project, you can develop yourself using specialized software, for example, Ashampoo Home Designer Pro 2.0.
software Ashampoo Home Designer Pro 2.0. 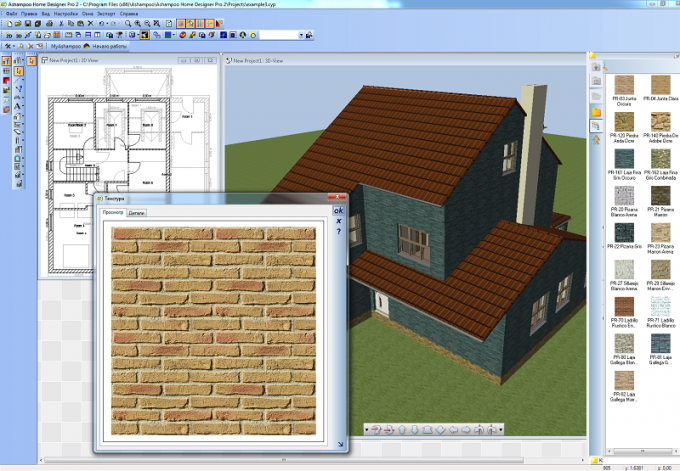 Download online Ashampoo Home Designer Pro 2.0, it is shareware, with a limited validity period. Officially to purchase this program for just$ 30. This software will allow you to realize three-dimensional visualization of the project of your building, Orient it to the cardinal, so you can see how it will be accommodated on the site. For its size you can draw the design using the tools available in the program. Select a unit of measurement, specify the scale at which to display the project. Clicking on the buttons: Wall, Window, Door, etc., draw the walls, Windows, doors and other facade elements of your future home. To do this, use the libraries, which present a wide variety of designs and textures. Each element can be viewed in the 3D viewer to have a clear view of its constructive features. In that case, when you want to make a project of a building of two or more floors, use a special function that allows you to move the floors, walls and ceilings from the first floor to the other. When you transfer specify the height of each successive floor. With ready-made libraries draw a roof. If the ready made options don't suit you, you can design it yourself. The program will automatically calculate its parameters: length, area. If you have a plan for your property, oriented to the light, move its boundaries to the project using the inventory data that are on the plan. The projected building will place in the border area. Using the simulated global lighting plan, which will include lawns, recreation areas, pavilions and so on, taking into account the shadow cast by this building during daylight hours. 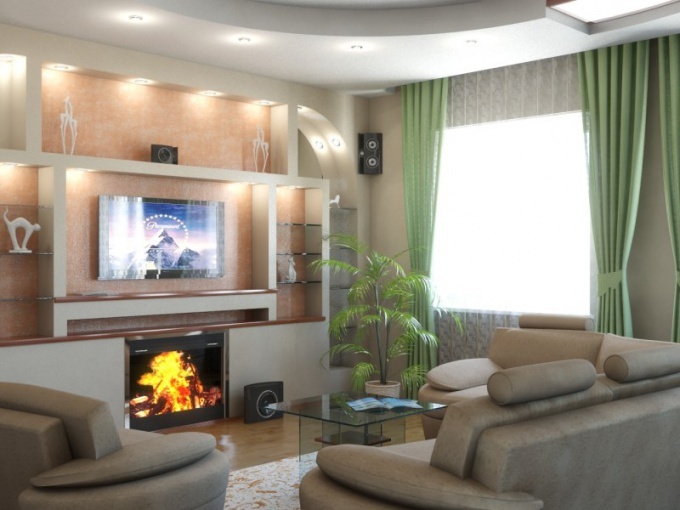 With the help of software product Ashampoo Home Designer Pro 2.0 you can also plan the interior spaces and their design. Available libraries allow you to place the internal situation, the most realistic show texture floor and wall coverings. Many pieces of furniture that you will find in the library are exact replicas of those models, which offer buyers the well-known furniture brands, so your visual project to be as realistic as possible. A novice user can use step by step wizard create project of a house. The breading is a special technique in cooking when cooking, usually of fried food. Main ingredients to prepare the batter: egg, flour or breadcrumbs. 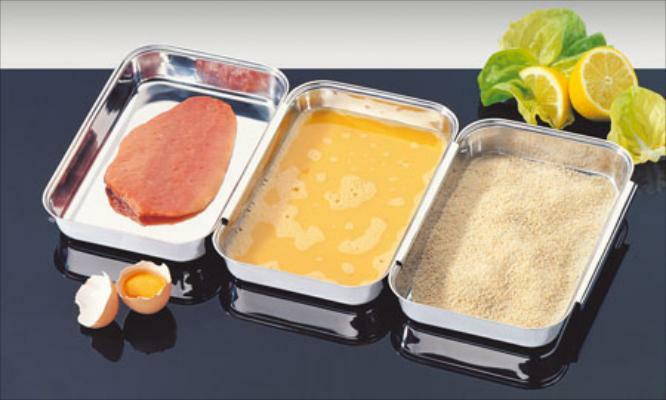 Can be used for coating hard cheese, semolina, stale bread. In the breadcrumbs you can add dried herbs, spices and dried vegetables. Eggs for breading can be whipped with cream or milk. Put the bread cubes on a baking sheet and place in oven. To make bread at 140 degrees for 30-40 minutes. Place the crackers in a blender, add dill and Basil and blend. Eggs lightly beat with cream. To let go of a piece of meat or fish in the egg. Then roll in the breadcrumbs. You can make a double breaded. For this it is necessary to go into the egg and again roll in breadcrumbs. If you were not salted and not peppering the main product, then salt and pepper it is fashionable to add in the breaded – usually in the dry ingredient batter. Fry the breaded product in boiling oil - fried food. Ready bread crumb can be stored in sealed containers in the refrigerator for up to several weeks. The interior of the room can delight or to irritate. The design space is important: the Wallpaper, the furniture, even the door handles. Have a color value, and the correct location of the objects. You can trust the designer and you can design the room yourself online. Apartments, small and large, standard and not much can surprise an original interior or repel tasteless design. Starting repairs, you need to determine the idea. Help in this photo gallery and construction (design) websites which exist on the Internet a huge amount. Having determined the style, you can go to the online design. Special programs will help to consider all the details, from design to the texture of the Wallpaper from the location of the sofa the color of the pillows. Sweet Home 3D is a free and functional software, which will help the user to realize even the most fantastic idea. It consists of four sectors. In the first you need to choose the type and add Windows and doors as needed. The second part is a two-dimensional measurement, is a drawing, which can move objects. The most interesting third part is 3D. And the fourth section is a list of used items. All the objects can freely move and adjust the size. But this easy to use program, there are also disadvantages: the lack of texture, it is impossible to choose the color of flooring and Wallpaper. The program StolPlit 3D, in contrast, can be papered room Wallpaper and choose the flooring. Visually simulate the room to help Aston dizayn. In option, already included a large range of furniture: from children to office. Another handy design software PRO100. Its toolbar contains the alignment, momentum, positioning and oncoming. Besides PRO100 allows viewing in seven projections and the use of graphic elements: transparency, contouring and dushevnie. Plus attracts light projection, sketch, texture, frame, color realistic rendering. Any of the above programs works on five basic principles. You must first create a room (new project). Next, you need to specify the dimensions of the room, in most online programs, you can stretch the length and height of the wall along the way. In the third stage placed the Windows and doors, on the fourth or furniture. And the fifth step is the most interesting when you can experiment with Wallpaper and floors, rearrange the furniture without much effort. Selecting the program and the concept of the interior, you can safely proceed to the online design. Most programs are free and work with them, you should read the instructions. They are available both for professionals and ordinary users.